For this week's Wednesday Treat Day, I gave Jeff full control on what we would bring in. I did nudge him towards a few cookbooks and recipe piles, but he really wanted to use our home grown strawberries and decided on this Strawberry Cobbler he found in one of our King Arthur Flour books. Because we wanted to use the freshest just-picked berries, we actually bumped up the treats a day and he brought this into the office today. 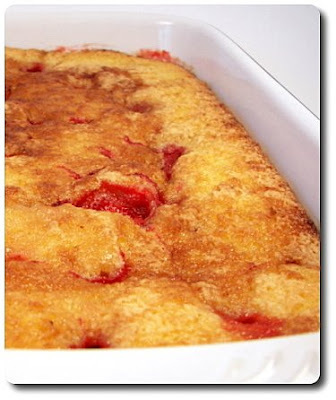 Usually when I think of cobbler, it is a hot bubbly layer of berries that are topped off with a biscuit dough-like crust. The version from this book is fairly different though, so maybe it is regional? Instead of the fruit being on the bottom, a golden batter is spooned into the baking pan first. The preparation was interesting as the eggs where beaten with the sugar first, instead of the fat, then the butter was mixed in with a few splashes of milk. Once done and in the pan, we moved onto the berries, which were coated in a hot syrup-y mixture of bright lemon juice, vanilla, a touch of almond extract and water. The original recipe actually opted for using liquor (using sherry, brandy or bourbon) with the sugar to create the syrup, but Jeff wasn't too keen on using alcohol for a work treat on the off chance people couldn't have it. If this is an option you would like to explore, remove two tablespoons of milk from the recipe, along with the lemon juice, vanilla, almond extract and water - replace them with half cup liquor of choice and melt that into the sugar. The hot sticky berries were then poured over the raw batter, then immediately placed into the oven to bake. This was definitely a fun one to watch in the oven - as the liquid-y batter bubbled up, it slowly began to envelop the berries, one by one, leaving you with a lovely marbled effect as the juices from the red berries stained the cake. We used small to medium berries and decided to leave them whole - if you wish to make this and have to use especially large strawberries, I do suggest at least halving them first. 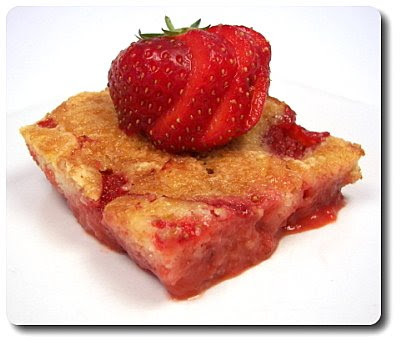 While it wasn't exactly what I was expecting when Jeff said cobbler, what we ended up with was a fantastically moist and homey cake that was studded with enticing strawberries, exuding their sticky sweetness throughout the crumb. Jeff and I were eager to find out what the lemon, vanilla and almond would bring, instead of using the more potent liquor - their supporting role was noticed and their subtle tones matched well, but still let our strawberries be the star. I did make sure to tell Jeff if they wanted the best experience, to be sure to let them know that a quick 10 or 15 seconds in the microwave to warm their pieces up ever-so-slightly would be nice. Of course, if you wanted to be extra decadent, a heaping dollop of whipped cream or a scoop of your best vanilla ice cream would finish this off with a bang! Looking for a way to perk up a pound of lean pork chops and have a little extra time to get messy? 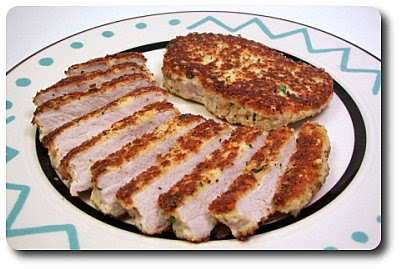 I was, and did, which is why these Parmesan and Sage-Crusted Pork Chops ended up on our plates tonight! Okay, so maybe the messy part is a little dramatic, but when I end up breading meat, I usually end up creating plenty of cleanup for myself. To get prepared, I needed fresh breadcrumbs that were made in a snap by whirling a single, but fairly large piece of slightly stale bread in our trusty food processor. Bread that is a day or so old ends up being a little easier to work with and doesn't seem to end up as gummy. To pack a punch into those crumbs, we combined them with sharp Parmigiano-Reggiano cheese and a dose of fresh sage, along with the requisite salt and fresh ground black pepper. Flour and an egg were needed, which we also seasoned - the flour with salt and pepper, while the beaten egg was pumped up with a dollop of tangy mustard. The flour and egg are used to ensure the cheese-laced breadcrumbs stick to the pork - just remember, using this trio method to coat, it always goes flour first, then egg and finally the crumbs. Going the route of pan-frying to cook these through, you won't want chops that are on the thicker side thick - each chop we used was about four ounces and maybe a half-inch thick. 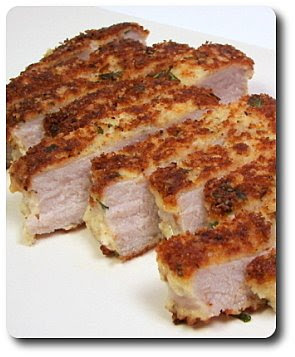 With the fresh crumbs and cheese, if the chops are too big, you might end up blackening the outside before the heat has a chance to reach the centers. If all you have are chops that are pretty thick, you could butterfly them, or perhaps start them on the stove and slide them into the oven to finish each one off. Cooked up in a flash (just under 3 minutes per side for us! ), our chops had a crisp, golden brown outside, while each was still plenty moist on the inside with just a hint of pink left in the center. Don't groove on pork? I bet this would be a delicious way to change up chicken breasts too - think about playing with the herb if you like, using fresh oregano or basil instead. While we only talked about 5 new recipes I made this week, I did prepare a slew of others (including a few strawberry!) that we'll eventually get to. I have so many new recipes now stacked up to show you, but I just don't have nearly enough time to sit down and post about them! Out of the ones from this week, our favorites were those fun Roasted Garlic, Asiago and Pepperoni Pizza Sticks, the Upside Down Rhubarb Cake and that fresh-tasting Shells with Two Tomatoes and Mozzarella. 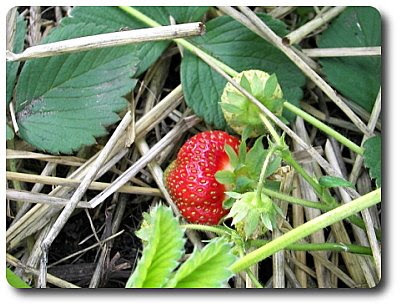 PS - the strawberry poundage we've picked from our patch as of last night? 25 pounds in total! Woo doggy! Tonight's dish is definitely one you want to wait until a day where you have plenty of time to play in the kitchen without much interruption if you want to get it on the table for dinner, which is why I opted for a Sunday night do this. 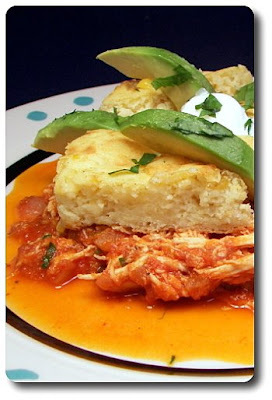 While I wouldn't say this Chipotle Pulled Chicken on Corn Spoon Bread is all that complicated to prepare, there are a few steps that happen at the same time that need attention. Poaching chicken breasts was on tap first, which we did simply by covering the meat with water and adding a bit of extra flavor in the form of chopped onion, a garlic clove, a touch of cilantro and salt. You need about a pound and a half of chicken for this, but the time needed to cook through will depend on the size of the meat you start with - we went with 6 four-ounce portions and they only needed to simmer for about 12 minutes. However, if you use 4 larger six-ounce portions, up the time to 18 to 20 minutes. As I waited on the chicken to cool down enough, the next part I worked on was a saucy chipotle pool we used to flavor the meat. To a skillet with softened onions and garlic, we stirred in a dollop of concentrated tomato paste and gave it contact with the heat to bloom. Fire-roasted tomatoes, that we pureed smooth with a couple smoky chipotle chiles, were poured into the mix and left to simmer, allowing the sauce to thicken. Now that the sauce was off on its own, I had to turn my mind in a different direction to take care of preparing the spoon bread! Who needs down time? Spoon bread is somewhat similar to cornbread, except the end texture is extremely moist and could almost be described as pudding-like. There is only enough flour used to give the spoon bread structure and hold together the generous moisture content coming from the creamed corn and tangy sour cream used. For a sharp note, shreds of white cheddar were also tossed into the lumpy batter just before we scooted it into the oven to bake. Not too long after the spoon bread went in, the chicken was cool enough to shred by hand and just when I finished that task, the timer ticked off for the sauce. Which is where that chicken needed to go, along with dried oregano for depth. Once the chicken had a chance to warm up in the sauce, it was finished off with a bit more fresh cilantro. Giving the spoon bread a short time to cool down, we found it to be extrememly moist when sliced into, but it was thick enough that we were able to pull out triangles to serve. 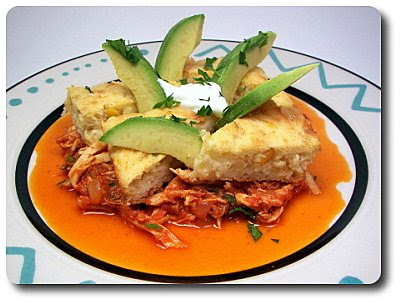 For a creamy bite, with the benefit of off-setting the heat in the chipotle, after we got the spoon bread and chicken onto the plate, we dropped a dollop of sour cream on each serving, along with rich avocado slices. My sauce ended up a little on the liquid-y side as you can see, so I wonder if I didn't have it on a high enough simmer? It didn't seem to dampen our experience though as we both made short work of our portions! Spread out over six servings, using just two chipotles in the sauce didn't empower a fiery heat, but left it with a savory smokiness that had enough punch to keep us happy. 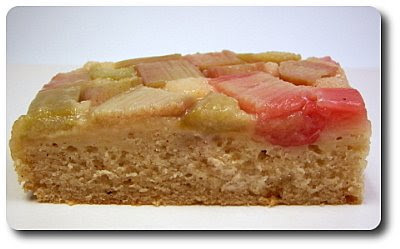 Our rhubarb plants seem to still be going strong, so after plucking a bunch of stalks to stash in the freezer for later in the year, I took the rest and prepared this Upside Down Rhubarb Cake to have as a treat today. 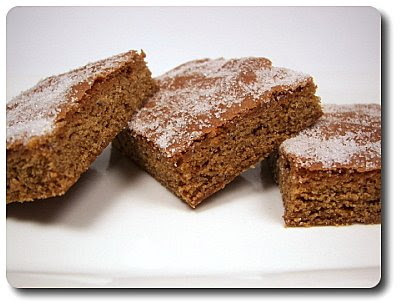 I used our common practice of using half all-purpose flour and whole-wheat pastry flour to retain a lightness to the cake, yet still impart a nutritional bonus. To impart a whisper of spice, I looked to our favorite Vietnamese cinnamon and shook just a touch over the dry ingredients to whisk in. The wonderful pair of butter and sugar set the tone of the batter, with a splash of vanilla for its liberal floral notes. Keeping the batter from curdling and to allow the flour to be evenly absorbed, without being overworked, the dry ingredients are alternately added in with the milk needed to smooth it out. Could you skip this and just add the milk into the creamed butter mixture first? Maybe, but why not take the extra minute to give you the best result possible? Because we wanted the top to look tidy, for extra insurance when preparing the pan, I lined the bottom with parchment paper before I started the assembly process of the cake. 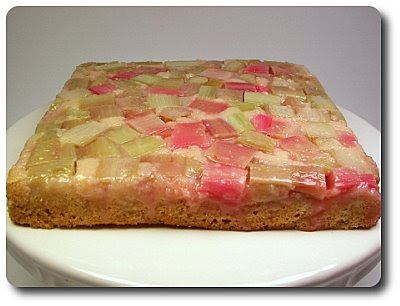 To prepare the rhubarb, after I sliced the stalks and scattered them into a baking pan, I doused the chunk pieces with granulated sugar to wrangle down their tartness. There isn't a ton of batter here, so to get the best coverage, we dropped dollops of it all over the top, then connected them all with an off-set spatula. It doesn't need to be perfect though, as the cake bakes, the batter will spread out and weave itself through the rhubarb, finding its way down to the bottom to hold everything together. After baking, don't try to flip the pipping hot cake out of the pan right away - give it a ten to fifteen minute rest so it holds together. Just sweet enough, this cake was quite moist with an intriguing, shiny mosaic on top from the tender rhubarb. I didn't know if the rhubarb would play well with the cinnamon in the cake, but we were pleasantly surprised to find just how well the two work together! While I don't think this cake needed any adornment, a scoop of vanilla bean ice cream on top of a warm piece certainly didn't hurt! 8 1/2 more pounds of perfectly ripe berries! And today, while the berries were a little smaller, we managed to pull off another 6 3/4 pounds. Dang! We are swimming in strawberries and lovin' every sweet minute. Nothing really struck my fancy when I was looking for pizza recipes to make for our Friday Night pizza, so I thought we would just stick some of our favorite ingredients on top and wing it. 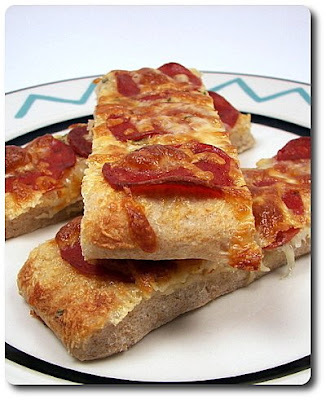 After playing around, I ended up with what we'll call Roasted Garlic, Asiago and Pepperoni Pizza Sticks. For the roasted garlic, I looked to a recipe we made back in March and prepared the garlic much the same way by roasting the individual cloves (just ends up being a little quicker) and mashing it to create a garlic smear. We took that now sweet and mellow paste and spread it all over the top of (wait for it....) our favorite whole-wheat pizza dough. What, did you think I'd actually branch out to another recipe? I know... not just yet - I just can't get over how easy to prepare and a dream to work with this dough is. Ok, ok I'll stop now... but really, try it if you haven't yet! Since we had the idea to make sticks, we stretched the pound version of the dough (giving us thicker sticks) into a large rectangle just before that lovely mashed garlic went on. Next came a wealth of Asiago cheese that we used our handy microplane to grate into tiny, fluffy shreds, which looked like snow as it fell from my hand and hit the dough. After looking at our patches of fresh herbs, Jeff said these flavors so far reminded him of those Cloverleaf Rolls we make every Thanksgiving and suggested we chop a few leaves of fresh rosemary to add. Once that fragrant herb made it on, I took a pizza wheel and sliced the dough in half lengthwise, then went back crosswise to make the sticks. I did this now to ensure the pepperoni slices I was about to add stayed intact, but I also wanted to be able to just pull the sticks apart from one another after they've baked. Doing it this way lets me complete the assembly of the pizza as a whole, rather than trying to fit the toppings on each individual stick too. 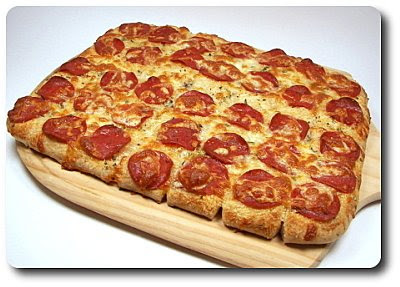 I did use turkey pepperoni simply because we find it less greasy and think it tastes just as good, without the guilt. Since we had it anyway, we swiped a couple ounces from a hunk of mozzarella we had in the refrigerator and shredded it to add on top. I mean really, as if we were going to just stop at the Asiago! To give the dough a little boost, I did give the topped dough a rest, allowing the yeast to do its business and add a little height. This doesn't take too long to bake either - these sticks were ready as soon as the dough was golden and that mozzarella we added on top had melted and turned golden in spots. Give it just a minute or two to cool down so you don't burn your fingers, but if you tear into it while it is still warm, the pieces come apart without any effort. However, if you let it sit, you might want to score through the cheese first so each piece isn't stripped of its topping. 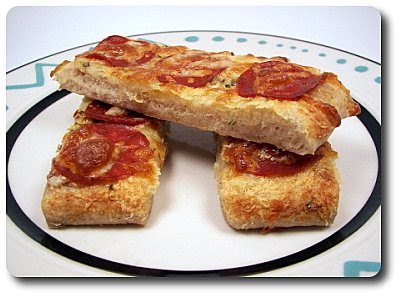 Using the pound of dough left us with sticks that were puffy and chewy, with enough crispness to the bottom that you could pick up each piece without if flopping around, keeping the topping in plate and not on your lap. As suspected, Jeff was spot on with suggesting the fresh rosemary - I figured its punch would match well with the roasted garlic, but more interesting was just how well we thought it worked well the spice in the pepperoni and nutty Asiago. Quite fun to make and chow down on, I can see these sticks being enjoyed by all ages - I'd even think about doubling the recipe just to freeze the extra pieces for easy snacks! Holy buckets - the strawberries are here! So, we've been anticipating the first pick... we went out this afternoon to survey our plots and guess what we ended up with? Whoa baby - just over 9 pounds of fresh, juicy and devilishly red strawberries, with many, many more to come. Yeah! I always end up over buying on pasta just because I like to have a variety of shapes and kinds (whole-wheat, multi-grain or good 'ol regular) handy in the pantry. 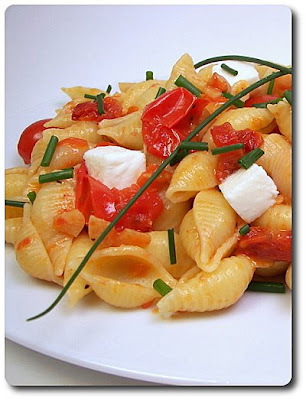 This works in my favor with recipes like we made for dinner tonight, Shells with Two Tomatoes and Mozzarella, as even if I don't have the exact shape called for, I always have some sort of backup that works just as well, if not better. While I was waiting for the roomy pot, filled with salty water, to bring itself up to a boil, I stashed the cubes of fresh mozzarella I needed into the freezer. Fresh mozzarella can be quite squishy and delicate to the heat, but letting it hang out in the freezer makes a world of difference in the end result, which I'll explain in a bit! After the pasta splashed around in the water and softened, I scooped out some of the cooking liquid, then drained away the rest. To keep the dishes down to the minimum, I let the pasta hang out in a colander while I prepared the sauce in the same pot (woo - go one-pot meals!) for this dish. Starting with a couple glugs from our bottle of olive oil, we tossed juicy grape tomatoes into the pot, along with sliced sun-dried tomatoes, an ample amount of thinly sliced fresh garlic and the reserved cooking liquid. This isn't a sauce that takes a long time to cook so its freshness can shine - all you need to do is heat the tomatoes until they begin to pop, soften and break down, which happens to be just enough time to rub the harsh razor edge off the garlic. 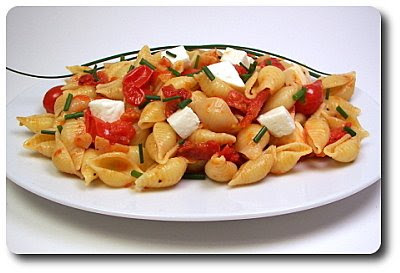 The pasta is tossed into the mix, along with those chilled cubes of mozzarella and a dose of mild chives snipped right off the plant in our backyard garden. Back to the cheese - if you tossed in the cheese that either came right from the refrigerator or had warmed up from being on the counter, as soon as you toss them in, the residual heat would have began the melting process, leaving you with a stringy mess. Which, in all honestly, isn't that big of a deal and wouldn't bother me, but if you want them to stay in their tidy cube shapes for those cheese pockets, this freezer business does the job quite well. The cheese won't stay cold or cool down the dish too much as the warm pot quickly brings their temperature back up. The original recipe called for penne rigate as its ridges would work well to catch the bits in the sauce, but when I noticed I didn't have near enough on hand (used most of it in last week's pasta dish! ), I grabbed for the shells. I figured their little pockets would make a perfect catch-all for the tomato, garlic and chives in this dish. Don't have either? Rigatoni would be another shape that would be a good match here. Plenty of pasta, a decidedly easy sauce and enough cheese to please... how could one go wrong?! 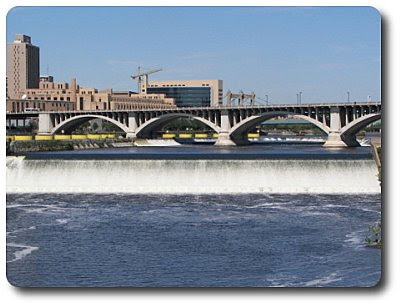 Today and tomorrow, Jeff is in meetings with his local co-workers, along with a few that had driven up or flew into Minneapolis to participate. 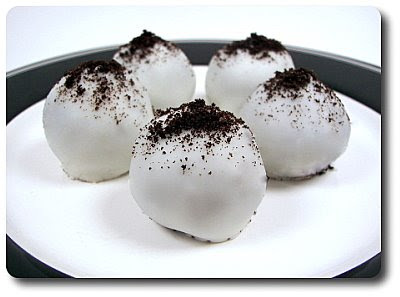 He asked if I could make a treat to bring in today, in addition to the regular Wednesday item - when I asked what he thought might be nice, his only suggestion were those dangerous Oreo Truffle Balls that we've made several times now! Yesterday I got rounds dipped and to change them up a bit, we sprinkled Oreo crumbs over the top. 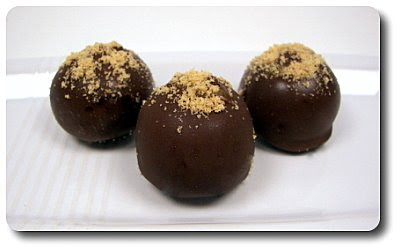 I also suggested for those peanut butter and chocolate lovers out there that we do a version with Nutter Butters! I used the same proportions, expect we used a darker chocolate dip, rather than the white chocolate we do with the Oreo version. 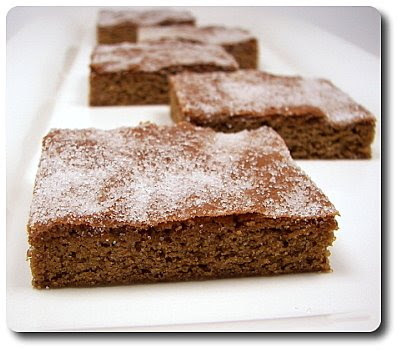 To be a little unconventional with this week's Wednesday Treat Day, especially after sending in those truffle balls this morning, I offered up these Gingerbread Bars and Jeff jumped right on board with the idea! I think of fall and the cool winter time when I hear gingerbread, but that doesn't mean it has to only be made during that time! Peppering the dry ingredients with familiar, richly aromatic spices in these bars are pungent ginger, sweet cinnamon, fresh grated nutmeg and a pinch of seductive cloves. To sweeten the batter, instead of using a lighter brown sugar, a more robust dark brown is used, adding moisture and a little chew, with a good measure of granulated sugar for depth and a touch of crispness. Giving gingerbread its classic darker golden color, along with a potent essence that is faintly bitter, yet still sweet is of course molasses! 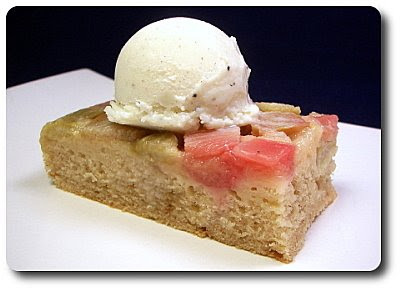 A little does go a long way here as you don't want the viscous syrup to overwhelm the bars. This recipe used an interesting technique that drew me to it - once the batter was spread into the baking sheet, flour was dusted over the top, followed by a light sprinkle of granulated sugar for crunch. It didn't say why this was done like this, but as I pulled the bars out of the oven, I found it to be a spiffy way to add an attractive, sparkly top that reminded me of an old-fashioned ginger cookie. Just before I retrieved the pan though, I kept thinking to myself how that the spicy aroma that flowed out from the kitchen to meander all over the house was reason enough to give these bars a chance! 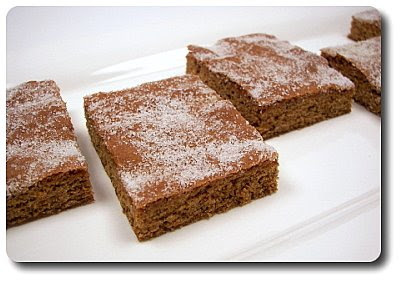 Sliced into hefty squares, after Jeff and I sat down and gave these a try after dinner, I found myself attracted to the lovely texture - kind of like a cross between a moist, dense cake, a tender blondie and an exciting cookie. Jeff tried to go back for another piece, but I reminded him he needed to share and to slowly back away! Besides, I have a feeling it won't be too long before these are made again and he'll get his share. 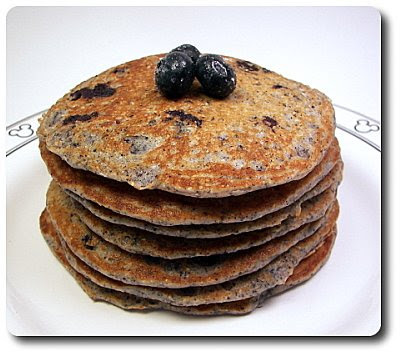 Jeff was excited to learn this morning that I was planning a breakfast-for-dinner night this evening, which was heightened when I told him it was going to be these Blueberry Cornmeal Pancakes! Making these a little more unique, I pulled out my stash of blue cornmeal that I keep in the freezer to use as part of the dry ingredients. Yellow cornmeal is perfectly acceptable, but I figured we might as well bust this out since we were using fresh blueberries... at least, that's what I told myself. Compared to yellow or white, blue cornmeal comes across as being a touch more nutty with a slightly sweet edge over the other two. To give the pancakes a little fluff and tang, a combination of thick buttermilk, milk, melted butter and an egg form the base of the liquid ingredients used to moisten the flour and cornmeal. When you pour this in the dry ingredients, use just a few flicks of the wrist to combine the batter and then let it be while you wait for your griddle to heat up. Lumps are good - if you work the batter too much, trying to get the batter completely smooth, you take the risk of ending up with tough pancakes! Lumps don't mean you'll end up with flour pockets... rest assured they will cook out! This batter is more viscous than you might be used if you've never used cornmeal in your pancakes before, so resist the urge to thin it out. What happened to the blueberries? Well, instead of tossing them into the batter, the plump berries are tossed with a bit of granulated sugar and then sprinkled over the top as soon as you dollop the batter onto the griddle. 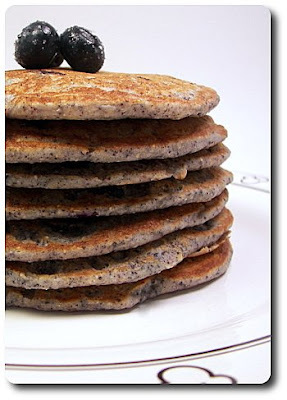 This way each pancake has roughly the same amount and you won't end up with a few pancakes at the end that have no blueberries! Don't look for the typical bubbles on top to let you know when to turn these since the batter is more thick - once the edges turn matte and look like they have begun to set, then slide your spatula underneath to turn them over. Serve a stack of these simply with a couple thin pats of butter, maybe a drizzle of your favorite warmed syrup, or since these are plenty moist on their own, a snowy dusting of confectioners' sugar would also do just fine on top. Not too thick, yet not paper thin either, I liked how beefing these up with cornmeal brought a heartier texture that was a welcomed addition at dinnertime. Unless you have a humongous griddle, you'll want to barely heat the oven to keep the first pancakes warm as you wait for the rest to be done. We got through seven new recipes this week - the ones we selected as our favorites were the Caprese Pizza with Bacon, that decadent Chocolate Pound Cake with Peanut Butter Glaze and those easy Turkey Wraps with Chipotle Mayonnaise. We had a pretty productive day yesterday and I thought it would be nice to give you a peek into how it went. 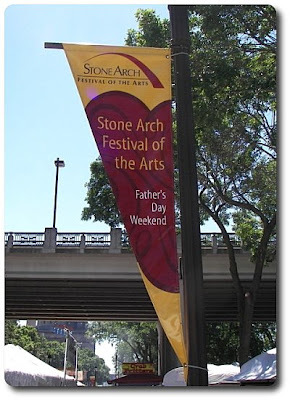 After we had those scones for breakfast, Jeff and I took Gus downtown to stroll through the artsy booths at the Stone Arch Festival of the Arts. It was such a beautiful day (if a bit toasty!) that we had to get out - we first went to this festival last year and had to go back this year. The booths were littered with fun, unique and quirky items - come on, doesn't everyone need one of these? Okay, so maybe that isn't our style, but I'm sure it will find a home! 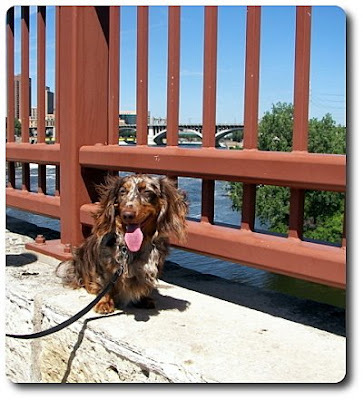 We walked Gus over the bridge so we could feel the cool breeze and he just couldn't help himself - he had to go sit up by the railing and strike a pose with his happy little tongue sticking out. And PS... Gus tends to be quite the people magnet... it took us a pretty long time to walk the whole event as we made frequent stops so people could pet him! 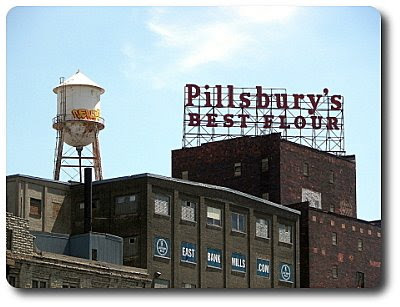 And you can't go down to St. Anthony Main without getting a snap of this old building! Once we got home, I had the pleasure (well, I wouldn't exactly call it a pleasure...) of getting these darn trees trimmed. 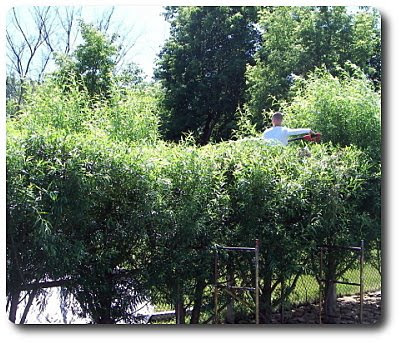 You would think these trees are on a drip supply of steroids with how fast they shoot their branches - they are called "Austrees" and are a hybrid of the Willow tree. 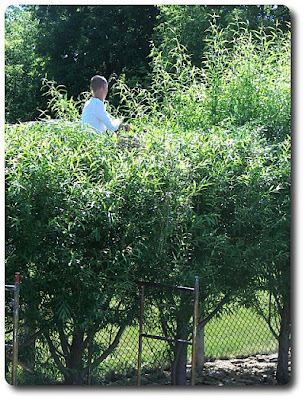 I first tried using scaffolding to get me up high enough, but that just didn't work as well... so I gave up and crawled up the middle of each tree - my legs are so sore from trying to not fall out! 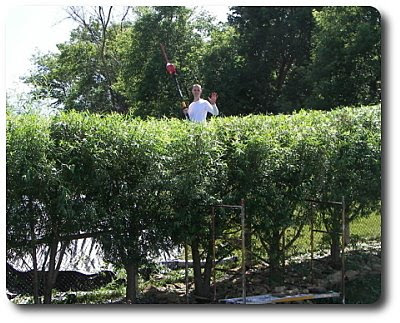 I cut about 3 1/2' to 4' off of each tree... and to think, this needs to be done at least twice, if not three times a year! I'm up about 18 feet at this point and all I could do was hope the branches wouldn't snap underneath me. This would have been impossible if we didn't pick up this handy trimmer... although, it got darn heavy after a few hours of hauling it up and down. Finally - all done and tidy... and the neighbors get their view back! 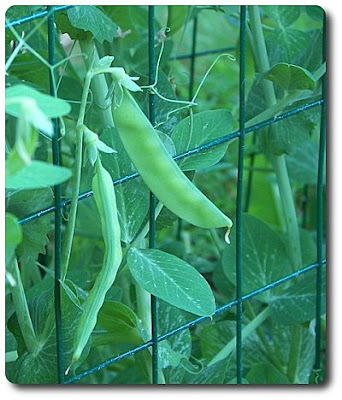 Before we get to the food, we went out and took some quick snaps to update how our little garden is doing! 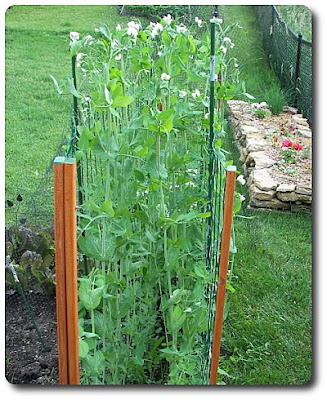 The snow peas didn't grow too tall, but the snap's sure did! 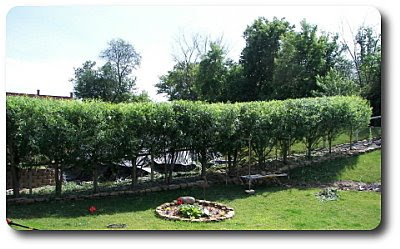 Here's another angle... the height of the fence only goes up to four feet. When we went up the strawberry bed, guess what we found?! Hello beautiful! It looks like the plants love their little hill. It's scone time again! 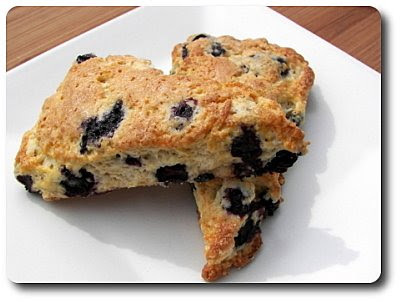 I made sure to get up a little earlier today as I thought these Blueberry-Buttermilk Scones might make for a nice change to have as breakfast this sunny weekend morning. 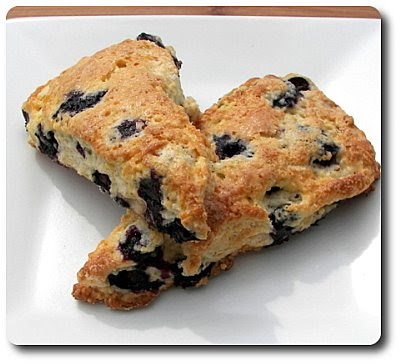 You could use completely all-purpose flour in the dry ingredients for the scones (as we've done that plenty of times before), but to give these a little more tenderness, some of that was swapped out for a softer, less-protein filled cake flour. With just three piddly tablespoons of sugar to sweeten, once we got the dry ingredients whisked together, I used my trusty pastry blender to cut in tablespoons of butter until the butter broke down, leaving us with a texture of coarse meal - basically you want the butter bits to be randomly sized, without being much larger than the size of a pea. You can also do this in the food processor, but that would have been too noisy for how early I was up! Also, because I quite like the pairing of lemon and blueberries, I tossed in a couple teaspoons worth of the bright, yellow-y zest as we went along. Just after we stirred in the plump, fresh berries, we moistened the dough with buttermilk, an egg and a few drops of pure vanilla. A few gently strokes later and before the dough had completely absorbed all the liquid, you'll want to scoop this unfinished dough out onto a lightly floured surface and use your hands to gently squish it together a few times until you've finished working in the remaining dry ingredients. After patting the dough out into a rough round, if you want smaller scones, divide the dough into twelve wedges, but I went with ten to get slightly bigger pieces. We've made recipes before where you just score the dough and then bake, which leaves you with softer edges, but if you separate the wedges, you'll get a crustier exterior all the way around. To enhance their tops with a bit of crunch and color, we brushed each triangle with a beaten egg and dusted with granulated sugar - if you happen to have coarser turbinado sugar, this would be a fine place to use it. After giving them a rest from baking (which happened to be just enough time to shower! ), I cracked into mine to find a delightfully moist, tender inside that contrasted beautifully with the almost crumbly sugar-spiked exterior. Since there isn't a lot of sugar used, I thought a jam might be nice to slather on, but the bursting of the berries added enough extra sweetness for me to think twice and leave it off. Plenty of scones are made with cream, which make for a delicious treat on its on, but the slight tang that comes through from using buttermilk is a pleasant change with the benefit of being less heavy on the fat. Plain yogurt could be used in its place to attain that tang if you wish - use the same half cup amount, but thin it out with a couple tablespoons of milk to up the moisture. 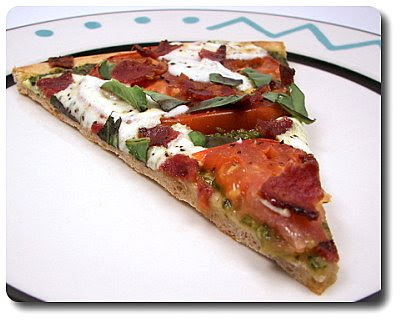 This week's Friday Night Pizza, Caprese Pizza with Bacon, is one that I will definitely be making again later this summer once our green tomatoes outside grow and ripen to a vibrant shade of red. Using our favorite whole-wheat pizza dough as a base, I drizzled the large round of dough with olive oil and gave it a good rub down with my fingers. Because we wanted a crispier crunch to the thin bottom, I slid the dough onto the stone and left it to bake until the bottom just began to take on a golden hue. As that was taking place, we kept busy by turning our attention to a few slices of smoky bacon I had cooking in a skillet. When it was almost cooked through, yet still a touch chewy, I snatched the pieces from the pan and let it drain as the crust was ready to come out. To give both sides of the crust contact with the stone, we flipped it over so the toppings would actually be arranged on what was the bottom. The first layer? A batch of homemade pesto that I was just barely able to make after snipping at our basil plants that were finally starting to get tall enough. The half cup we used was pretty lavish for this pizza and I think you can get away with using a third of a cup without losing out. Rounds of a large tomato (if yours are on the smaller side, you might wish to add two) were laid on top, followed by just enough thinly sliced fresh mozzarella so each bite you took had a piece. This isn't the type of pizza that you want to drown in cheese so every inch of the top is covered, but you don't want to be skimpy either. 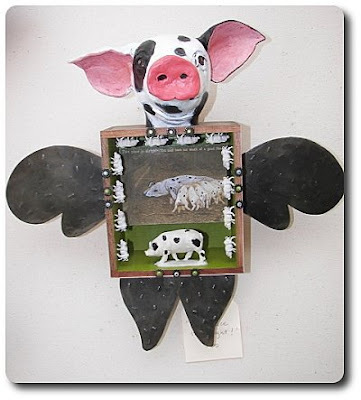 Remember that bacon? After seasoning the cheese and tomatoes with a bit of salt and fresh ground black pepper, the chunky crumbles were scattered on top just before the pizza went back into the oven to finish baking. The reason I left the bacon a touch chewy is the pieces are not hidden under a blanket of cheese, so they will crisp a little more from the intense heat of the oven. The only thing this pizza needed was a smattering of torn fresh basil once it was ready. 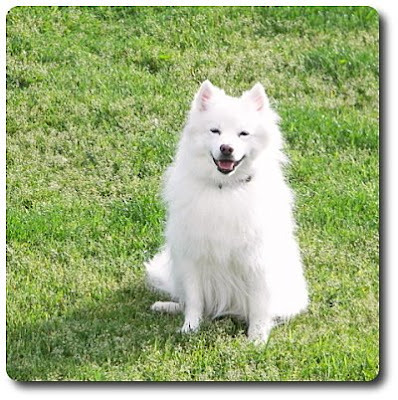 Jeff asked, before taking a bite, if he should grab the wedge of Parmesan from the refrigerator to grate on top. I said "Taste it first... then you tell me!". He did and after I heard him finish comping through the crust, he muttered "Okay, I get your point". So there! Actually as I put Parmesan in the pesto, its sharpness came through in that layer well enough that there was no need for another dose on top. 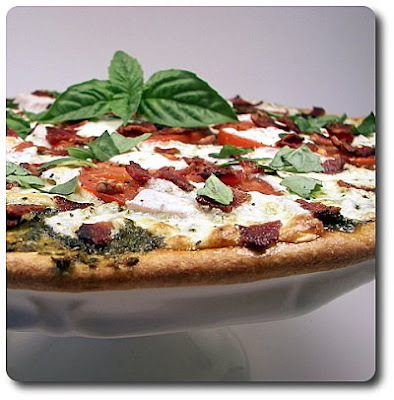 Using the bright pesto as the "sauce" was an ideal match as its freshness blew away anything else you might be tempted to use, especially when paired with the tomatoes and mozzarella. If you think you might have a problem getting the cheese to slice into thin rounds, wrap it up and toss the ball into the freezer for just about 15 minutes to firm it up. After spending a good portion of the afternoon getting work done outside, when it was time to come in to prepare dinner, I knew I was not going feel like doing much. 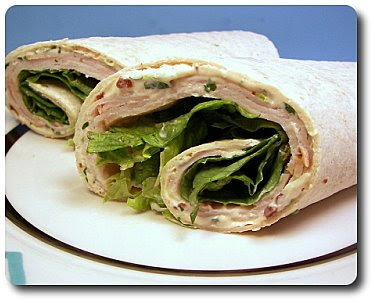 That's why I planned these snazzy Turkey Wraps with Chipotle Mayonnaise for a non-fussy dinner that didn't involve much work. While a turkey wrap may not sound all that exciting, that darn chipotle mayonnaise we smeared on demanded our attention and completely made these. That spread is created by swirling together mayonnaise, fresh cilantro, a minced scallion, a hefty tablespoon of smoky chopped chipotle in adobo sauce and a couple squirts from a lime half. If you would rather not use mayonnaise, I've made the switch before by using equal amounts of sour cream and Greek yogurt for a creamy base that still presents a nice tang to it. 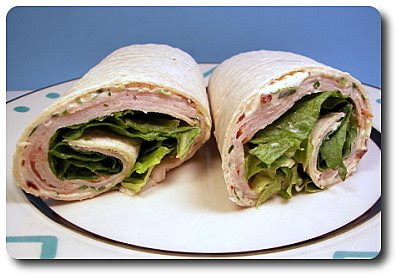 Once we spread that concoction over a couple large tortillas, we arranged thinly sliced smoked turkey meat on top, along with crisp romaine leaves for a little texture. That's all there it to it! Just the right kind of no-nonsense dish I needed after today. I'm thinking this would be perfect to take along to enjoy on a picnic as well! You can cut down on the chipotle if you don't groove on the heat, but I really didn't find it to be all that spicy since the mayonnaise and lime juice worked well to balance. This recipe makes enough for two servings that were satisfying for us, but you could easily adjust up if you need to serve more. If you wanted to expand on the smoky theme with a little extra work, I bet some strips of crispy bacon down the middle would be a nice touch! I don't know what it is about broccoli... I would not go near it growing up and didn't work it into my diet until maybe 6 years or so ago. Though, I can probably say that about most vegetables, but broccoli ranks right there. However, now I love to snack on it raw, steamed, roasted or sautéed - funny how things change! 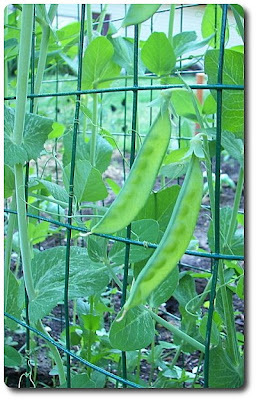 I think it would be fun to grow it next year if the gardening continues to work out for us... before you know it, we'll have dug up the entire back yard and have filled it with food! The dogs may have something to say about that though. 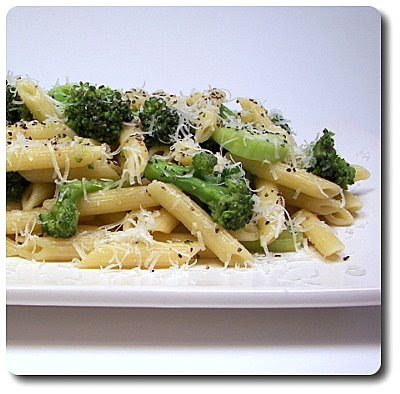 In the mean time, we'll just have to pick it up from the market like we did today so I could make this Spicy Pasta with Broccoli for dinner. 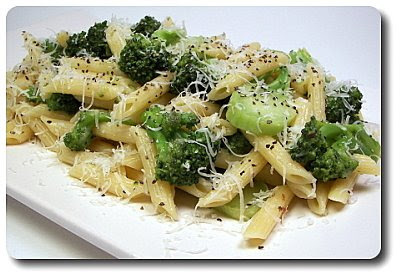 What initially drew me into this dish was the use of the entire head of broccoli, stalks and all. 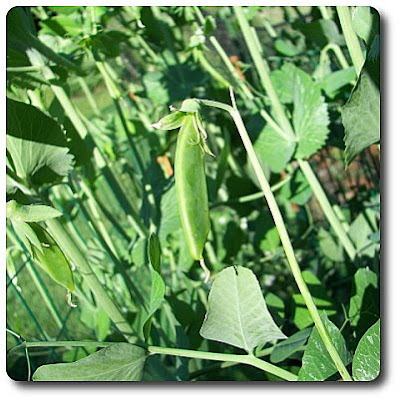 The stalks don't seemed to be used all that often and while they seem to be slightly less flavorful than the florets, they are still tasty and full of nutrition. While you don't have to do much to the florets but slice them off, the stalks do take a little more effort. The first thing you need to do is remove their tough outer skin either by using a peeler or paring knife - once that is off, they then need to be sliced into thin pieces so they are able to cook at the same rate as the florets. 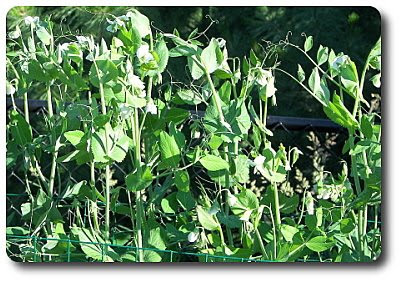 The stalks also work well for to make broccoli slaw instead of or in addition to cabbage for crunch. 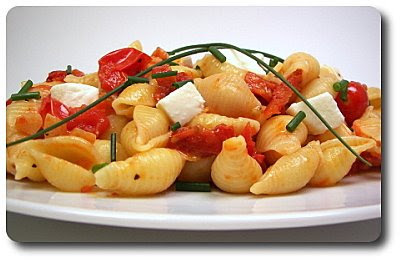 Use any type of short pasta you like - orecchiette or fusili would be nice, but our pantry already had penne on hand and we went with that. While the pasta was off cooking, we had another pan on the stove heating up with a slick of oil to toast a few cloves of sliced garlic and a couple pinches of crushed red pepper. The broccoli florets and stems were slid into the party with a splash of water - this creates a steamy environment once the cover is added to help start chipping away at the rawness. After a few minutes, the cover is removed, allowing the excess water to evaporate and the broccoli to finish coming to the crisp-tender point. When the pasta was ready, we scooped out a rough half cup of the starchy water, then drained away the rest. The pasta was put back into the pot (off heat! 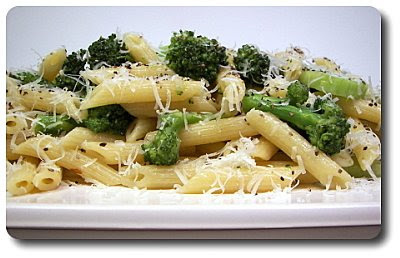 ), along with the garlicky broccoli and handful of fresh grated Parmesan cheese. Enough of the saved cooking liquid was added, which melted the cheese and bound this dish together with a thin sauce. Once portioned out, we sprinkled a little extra Parmesan on top for a salty finish, which was definitely welcomed and appropriate. An enticing veggie meal for sure, if you wanted to stretch this out and introduce a little meat, I bet cooked and crumbled Italian turkey sausage (especially hot, but I wouldn't dismiss the sweet variety!) would be an exciting addition to bring in a little flare.